In previous article we discussed Organization Chart using google visualization chart. 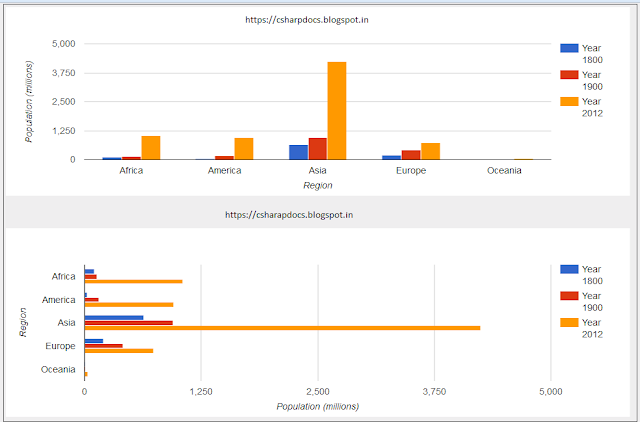 In this article I will explain how google visualization charting tool useful for displaying Bar and Column chart using ASP.NET MVC. In my careers starting days with ASP.NET, I remember we used different type of third party control to implement chart functionality in applications. But now using different open source library provides inbuilt support for different Chart in a very simpler fashion. The Google Charts shows how we can display Bar and Column Chart in very simpler manner . Step 4: Create appropriate model to display data. We already discussed this model in my previous highchart post. So utilizing same code here as well. Step 5: Create controller file and create action do display result. We already discussed this controller code in my previous highchart post. So utilizing same code here as well. Step 6: Now, run the application to display Bar and Column Chart respectively. Using Google Visualization Chart tool, it is very easy to show chart in your ASP.NET MVC application. In this article, I showed you how to create a Bar and Column Chart in ASP.NET MVC. Hopefully you will enjoy this article too. In my next blog post article, I will explain how Google Visualization Chart tools are useful to display Pie, 3D and Donut Charts in ASP.NET MVC.